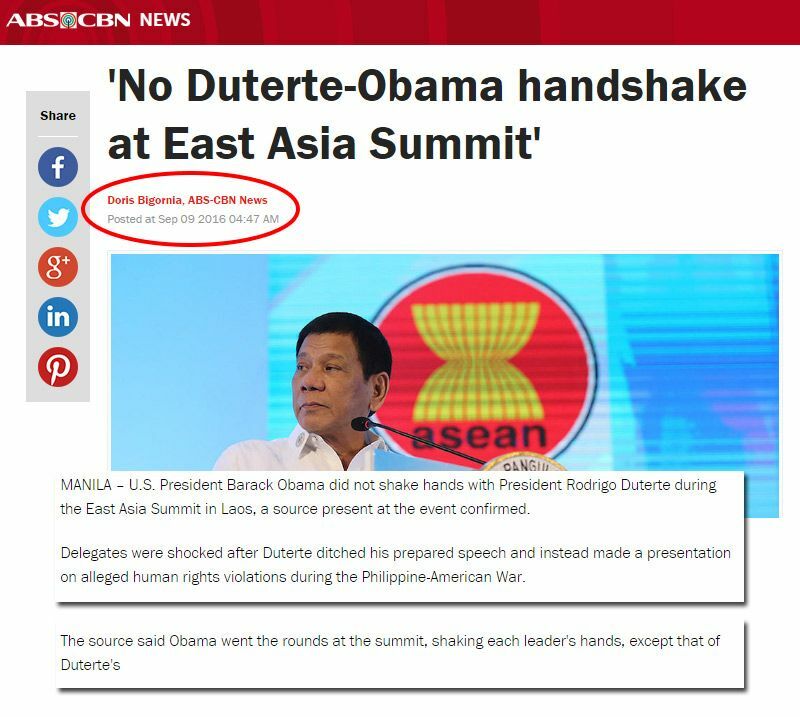 It appears that ABS-CBN correspondent Doris Bigornia twisted the news when she reported that the Duterte-Obama handshake did not happen. U.S. President Barack Obama did not shake hands with President Rodrigo Duterte during the East Asia Summit in Laos, a source present at the event confirmed. Delegates were shocked after Duterte ditched his prepared speech and instead made a presentation on alleged human rights violations during the Philippine-American War. The source said Obama went the rounds at the summit, shaking each leader's hands, except that of Duterte's." Was Bigornia's source real? Because as far as we know, Obama himself publicly admitted in a press conference on Thursday that he shook hands with Duterte. In fact, it was telecast live on television and mainstream news sites reported about it. President Obama said he shook hands with Philippine President Rodrigo Duterte at a regional summit on Thursday, two days after canceling a bilateral meeting following Duterte's use of a profane epithet while criticizing about Obama. "I don’t take the kinds of comments personally," Obama said at a news conference, noting that Duterte had used the same phrase when talking about other world leaders, including the pope. It seems to be "a habit, a way of speaking for him." It seems like all is well with President Rodrigo Duterte and United States President Barack Obama. Obama on Thursday said he did not take profanity-laced comments by Duterte as a personal attack on him. Obama added that he doesn't expect the controversy to affect the relationship of the two countries. Obama also confirmed that he had an interaction with Duterte on Wednesday night as initially reported by Malacanang officials. "I did shake hands with President Duterte last night. It was not a long interaction. And what I indicated to him is that my team should be meeting with his and determine how we can move forward on a whole range of issues," he said. Take note that ABS-CBN News published the article at 4:47 a.m. today, September 9, several hours AFTER the US President held the presscon where he confirmed that a handshake between him and Duterte occured. Is it now safe to say that ABS-CBN reporter Doris Bigornia "twisted" the news?